This study aimed to identify key components of quality of life (QoL) and assess the impact of insulin pump therapy on children/adolescents with type 1 diabetes and their parents. The Schedule for the Evaluation of Individualised Quality of Life (SEIQoL) interview was adapted to be (1) insulin pump-specific, (2) suitable for children and their parents, and (3) suitable for telephone administration. Interviews were conducted separately with children/ parents to elicit the five most important aspects of life for their QoL and to identify the impact of insulin pump therapy on those domains. All children (and parents) who were registered on the Roche Diagnostics insulin pump user customer database were invited to participate. Participants included 15 children/adolescents (mean age 12.07±2.71 years; range 9-17 years) and 17 parents. Mean diabetes duration was 6.67±2.42 years (range: 2-12 years). There was no significant difference in length of interview between parents and children (p=0.281). All parents reported the impact of their children's insulin pump therapy on their own overall QoL as positive (47.1% very much better, 35.3% much better, 17.6% better). Fourteen children/adolescents answered this question and all responses were positive (28.6% very much better, 57.1% much better, 14.3% better). 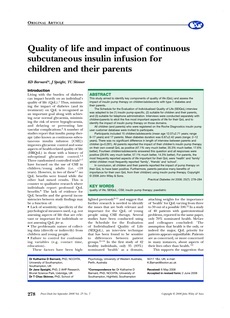 For parents, the most frequently reported aspects of life important for their QoL were 'health' and 'family' whilst children most frequently reported 'family', 'friends' and 'school'. In conclusion, all children and their parents reported the impact of pump therapy on their QoL to have been positive. Furthermore, parents perceive many benefits of importance for their own QoL from their child(ren) using insulin pump therapy. Copyright © 2008 John Wiley & Sons.